Janssen was joking, of course. He liked to do than when it came to his most famous character portrayal. In an interview on Joey Bishop's show following the airing of the final episode on August 29, 1967, he admits, "I killed her, Joey. She talked too much." But there was nothing funny about the impact The Fugitive had on the culture, as Dwight Whitney relates on the eve of the show’s two-part series finale. French intellectuals, of course, wanted to look at the show’s existential connotations. The Germans, foreshadowing reality shows like The Great Race, wanted Janssen to travel through Berlin in disguise, with people competing to track him down. In Spain, viewers haven’t quite caught on to the fact it’s a recurring series, and great each episode with great anticipation, wondering whether or not this will be the week his luck runs out. Janssen could have gotten a half-million for agreeing to a fifth season of The Fugitive, but he thinks in retrospect that “I would have fallen apart” if he’d signed on. The rigors of doing four years of a series in which he appears in almost every scene, with no regular supporting cast to help ease the burden, have taken a physical and mental toll. His smoking is up to three packs a day, and his drinking is up as well, which often leaves him depressed. His ulcer has returned, his trick knee often forces writers to incorporate the resulting limp into the script, and when he is exhausted – as he frequently is – his performance begins to develop tics and other mannerisms. His character is forever reactive, always running, and there are only so many ways in which an actor can portray a man who is not weak but cannot afford to appear too strong. The show’s fans, and after four seasons there are still many of them, are glad Kimble’s situation will be resolved, but sad to see the series come to an end. 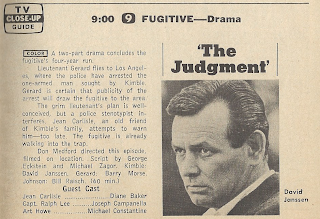 “Of course, I knew he had to be exonerated some day,” says one viewer, but “I just wasn’t expecting it to happen – well, quite so soon, you might say.” Those fans will turn out in force to view the final two-part episode of The Fugitive, entitled “The Judgment,” and that last episode is the most-watched television show in history to that time, racking up a record 72% share of households with television sets. The other networks must have known what they’d be up against; opposite part one of “The Judgment,” CBS aired a Harry Reasoner documentary on “The Hippie Temptation,” while NBC showed a rerun of the movie The War of the Worlds. 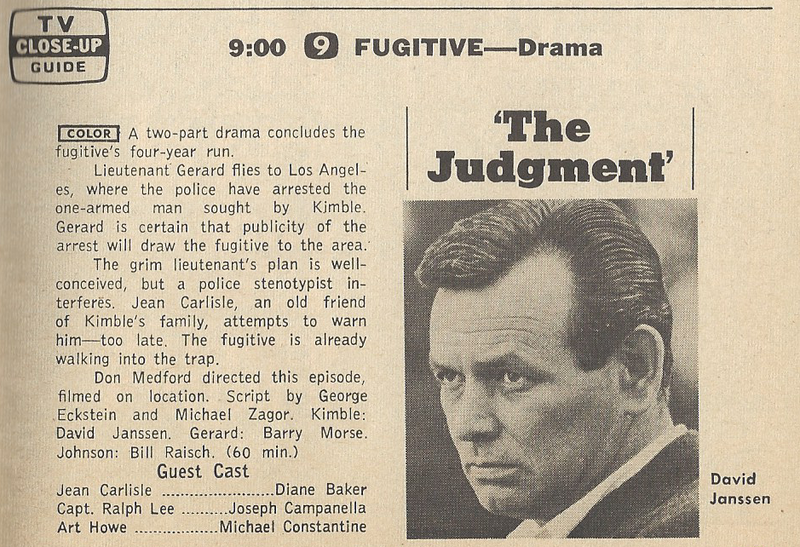 I’ve mentioned this before, but it bears repeating that unlike other series finales, the conclusion to The Fugitive was aired in August, after the rerun season. As it was known that the fourth season of The Fugitive was to be the last, this allowed the suspense to build up throughout the summer; had that final episode aired in May or June, the reruns might have seemed ridiculous, but this way they were still relevant, still part of the chase, since Kimble was theoretically still running. Therefore, when the series ended, it really ended. It’s a brilliant idea, and I still wonder why more series don’t do it that way. We’re back in London for this episode of Piccadilly Palace, and this week Millicent Martin dons the hosting duties for an “evening of swingin’ sounds,” with singers Matt Monro and Bruce Forsyth. Ed’s in reruns for the summer, with guests Jimmy Durante; singers Connie Francis and the Four Seasons; musical-comedy star Gwen Verdon, who does a song-and-dance routine from “Sweet Charity,” and the Festa Italiana dance group. Matt Monro was a smooth-voiced singer, whom you’d probably recognize from two of his biggest hits, "Born Free" and "From Russia With Love." Sir Bruce Forsyth has been a British TV regular since the 50s, and even today, at age 85, he continues to host the successful BBC show Strictly Come Dancing, which we here in the States might recognize by its American name: Dancing with the Stars. But I’m going to have to go with Ed this week. Jimmy Durante was one of the great characters of movies and television, a man who could steal any scene, and even though by 1967 he’s already had a long and successful career, he’s still two years away from one of his most recognizable roles, that of the animated storyteller in the Rankin-Bass cartoon Frosty the Snowman. Connie Francis was lovely to look at if, at times, somewhat difficult to hear; and Gwen Verdon was - well, just a terrific singer and dancer. Damn Yankees, Sweet Charity, and Chicago were some of her stage credits, and if you ever saw her with that flaming red hair and those legs, you wouldn’t forget. Hands down, this week goes to Sullivan. 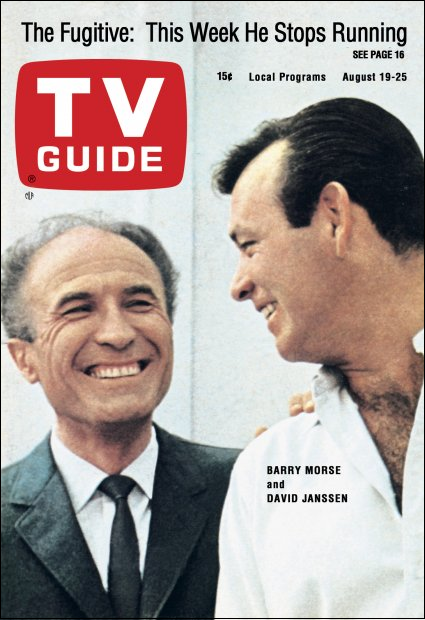 These summer issues of TV Guide are always something of a mixed bag; with most of the networks in rerun mode, there isn’t always a lot to choose from, with summer replacements the best bet. I’ve previously mentioned Jackie Gleason’s fill-in, Away We Go, hosted by the unlikely combination of George Carlin and Buddy Greco,* and the Smothers Brothers’ replacement, Our Place, hosted by Burns and Schreiber, as well as Vic Damone, Dean Martin’s summer host, and the appropriately named Spotlight, Red Skelton’s replacement. *Fun fact: Buddy Greco’s second wife (of five) was Dani Crayne, who later divorced him and married - David Janssen! 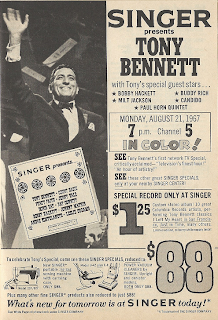 Tony Bennett’s terrific NBC special on Monday night is a rerun, notable because it’s another in the occasional series of “Singer Presents” specials, sponsored by the sewing machine company. Herb Alpert and Burt Bacharach are other performers featured in Singer showcases, but the most famous of the specials will be in December of 1968, when Singer Presents – Elvis Presley. 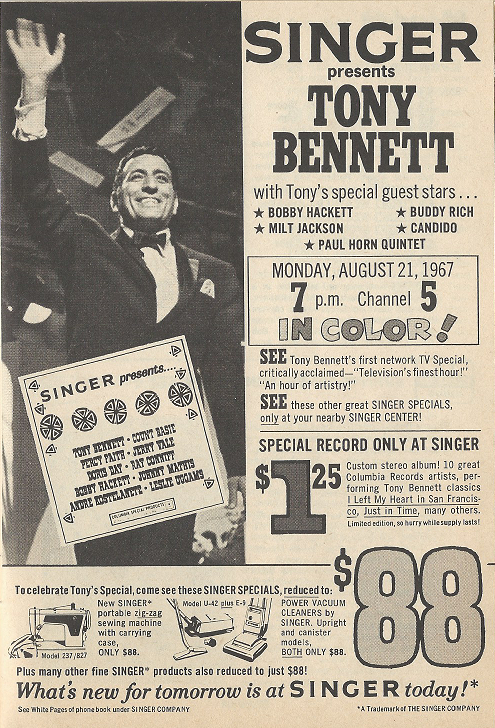 That ’68 comeback special, as it came to be known, remains one of television’s iconic programs. There’s sports to be had as well, and although the NFL offers a prime-time exhibition on Monday night between the Baltimore Colts and St. Louis Cardinals* set to kickoff at 8:30pm CT (late start! ), the focus is on baseball. That red-hot pennant race continues in the American League, playing out on our television sets: the Minnesota Twins, beginning the week with a slim 1.5 game lead over the Chicago White Sox, are featured on local broadcasts against the New York Yankees (Saturday and Sunday), the Detroit Tigers – who trail the Twins by only 2.5 games (Tuesday and Wednesday), and the Cleveland Indians (Friday). Meanwhile, the Boston Red Sox, a mere three games behind Minnesota, face off against the California Angels, only five games back. By the end of this week’s TV Guide, the Red Sox and White Sox will have closed to within a half-game of the Twins, with the Tigers only 1.5 games back. *Or as we’d know them today, the Indianapolis Colts and Arizona Cardinals. Israel watches Egypt – on television. That’s the news from Robert Musel, who reports that Egyptian television – widely considered not only the best in the Middle East, but the equal of many networks in Europe – attracts a significant number of Israeli viewers every day, since Israel doesn’t yet have its own television network. It’s a message the Israelis themselves could benefit from, according to a number of experts who say the nation has been slow to realize the propaganda value of TV. Its first prime minister, David Ben-Gurion, had felt that television had little to offer his people (they’d be “better off reading books”), until he saw a nature documentary while making a state visit to France. Ben-Gurion was fascinated by the show, which included film shot from inside a beehive, and said that “Israel had to have television like this.” He feared that, due to the country’s high taxes, only the rich would be able to afford sets, but as many a nation has discovered, the truth is that low-income groups love their television as much as anyone. But though Israel may have discovered that television isn’t all bad, it still has yet to use it to their advantage. Israel won’t begin its own broadcasts until 1968 – far too late, according to Musel, who says they should have been exploiting it for years, giving its neighbors a look at what the country and its people are really like. Foreign correspondent Shelby Scates of the Seattle Post-Intelligencer tells Musel that most Arabs “had no idea what the average Israeli was like” other than the “highly-colored” acconts from Arab newspapers. The Israelis are missing the boat, says Scates – “If the Arabs could see this land of milk and honey and the people in it, they wouldn’t be so afraid.” An Israeli journalist agrees, saying that “It’s time the Arabs stopped thinking we’ve got two tails.” Television as a bringer of world peace? I think it’s naïve, but maybe, back in 1967, not so much. Don't forget - the Top Ten countdown continues on Tuesday! I had heard Janssen's first joke about THE FUGITIVE! It was a terrific show and ranks with my all-time favorites--but I'm glad Janssen walked away after season 4. There was a noticeable drop in quality from the first three seasons. Agreed - there was a time when four seasons might have seemed quite short for a successful TV series, but in fact so many of the great series really have a limited shelf-life in that it's so difficult to keep a high standard for a long time. I've come more and more to appreciate the British style of shorter seasons as a way to keep the quality high.